An armed robbery in the early hours of Thanksgiving Day was reported on Freret Street near Jefferson Avenue and a man was grazed by a bullet in Carrollton over the weekend, police said Tuesday. The robbery victims were walking in the 5300 block of Freret around 1 a.m. Thursday, Nov. 25, when they were approached by two men with a silver handgun who demanded their belongings, according to a news release from the New Orleans Police Department. The victims gave the robbers what they wanted, and the robbers then left, and the victims called police the next day, the release states. Anyone with information on the robbery is urged to call Detective Jerry Baldwin at 658-6020. On Saturday evening, a man and his girlfriend were walking in the 8300 block of Green Street in Carrollton when they heard gunshots being fired behind them and began running away, police said in a separate release. Afterward, the man realized a bullet had grazed the inside of his thigh, police said. The victims could not describe the shooters, police said. Anyone with information is asked to call Detective Christian Varnado at 658-6020. In either case, you can also call Crimestoppers to leave an anonymous tip that could lead to reward money at 822-1111. 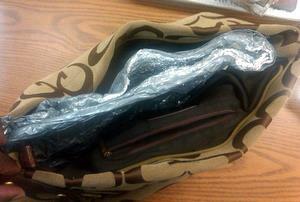 This aluminum-foil and duct-tape pouch was used to deactivate Magazine Street stores' anti-theft devices, police said. Creative shoplifters | Two women were arrested on shoplifting charges on Magazine Street despite their ingenuity in devising a method to defeat anti-theft tags on merchandise, police said. A clerk at Ele’s Shoe Store in the 3300 block of Magazine called police after seeing two women trying to secret merchandise into a purse, police officers found a pouch made of aluminum foil and duct tape inside the suspects’ purse, they said. When an item with an anti-theft tag is put inside the pouch, it can be passed through a store’s shoplifting detector without setting off alarms, police said. Charged in the case were Ashley Connelly, 22, and Dion Magee, 24. Detectives determined that the women had also just come from using the device to steal items from American Apparel and Franchesca on Magazine Street, and returned the stolen merchandise to those stores, police said. Detectives are reviewing previous shoplifting cases on Magazine to see if Connelly and Magee were involved, police said. 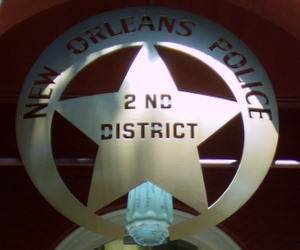 Lower Garden District drug arrest | Based on complaints from community meetings, narcotics investigators recently searched a home in the 1400 block of Constance near the intersection of Terpsichore, police said. They found nearly 9 grams of marijuana packaged for distribution and $85 in cash, and arrested 20-year-old Jarret Morris on charges of possession with intent to distribute marijuana and heroin. Shooting in Broadmoor | A man walking in the 3200 block of Delachaise Street in Broadmoor was shot and wounded by two strangers with guns last week, police said. The attack took place about 6:30 p.m. Monday, Nov. 22, and the victim was struck in the right arm and torso, police said. That same block was also the site of a robbery last week, in which a man drinking beer in front of an abandoned house was beaten and his property taken, police said.